"I don't think those fans are correct, and more importantly I don't think their concerns are going to hurt either game. I think that Hero's being able to work with Cryptic will ultimately improve both games. As much as I'd like to see an MMO based entirely on the HERO System (an immense programming task, to be sure), in many ways paper RPGs and MMOs, despite their common roots, aren't the same thing. What works for one won't always work for the other, and vice versa. What you should expect is that Cryptic's ideas and work will help Hero as we produce Champions books, and that our Champions books will not only give Cryptic more material to work with, they'll give MMO players information about and insight on the MMO game world that's not available anywhere else. At the risk of throwing out a business school buzzword, it's a synergy." Long, who seems fearless in the face of this new age for Champions - and paper-RPG adaptations in general - is sure that both MMORPGs and traditional RPGs can appeal to players at the same time. "There are countless aspects to a superhero setting that an MMO can't or doesn't cover that a paper RPG needs to, so there'll still be plenty of room for me to exercise my creative muscles and provide Cryptic with ideas." The influences between game types go both ways, though: "I think with the release of D&D 4th Edition this summer we're going to see just how much MMOs have influenced RPG design. I suspect D&D is going to try hard to emulate a more MMO sort of feel and play style, and to attract players introduced to the concept of 'RPGs' by World of Warcraft and other MMOs. I'd expect to see more pre-built, drag-and-drop kind of stuff so that you can easily create and 'advance' a character by picking and choosing from a menu. Obviously that's sort of what D&D has been all along, but you'll see more of it, done in a more modern style. And even the HERO System, the quintessential 'build your own' RPG rules set, isn't entirely immune; as I mentioned above, I'll do pre-built Champions Online power packages for the next edition." As the game properties reinvent themselves for the next generation, so will the whole concept of what an RPG is and does. 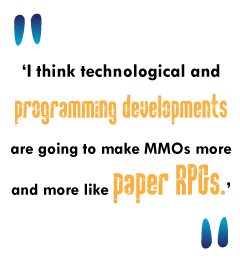 "In MMO terms, going forward I think technological and programming developments are going to make MMOs more and more like paper RPGs. You're going to see more character customization and options (Champions Online is really going to push the envelope here, I think, and set new standards), more freedom to interact with the environment and NPCs, and so on. That will just keep growing and growing until we reach the point where the computer can virtually function as a GM, and where other tools allow for greater social interaction among players. There will always be a small niche market of people who want to play traditional paper RPGs, but that's all it will be - a small niche." Will Hindmarch is a freelance writer and game designer, as well as the co-founder of Gameplaywright.net. Do not talk to him about zeppelins or we will be here all day.